Lord Hugo Starling, youngest son of the Duke of Willingham and friend of Benedict Frost, happens upon Georgette just as she is about to board a stagecoach. Hugo is focused on securing funds for a hospital where his unconventional ideas about medicine can be put into practice. He has alienated his family by offering his medical services to the masses rather than to his own class. They were not happy when he insisted on a career in medicine rather than entering the Church, according to his father’s plans for him, nor with Hugo’s decision to study in Edinburgh. His father vehemently objects to his hospital plans, but Hugo is undeterred. However, when none of his ideas for funding work, he decides to accompany Georgette to Derbyshire and see her into her brother’s charge. Georgette and Hugo have thirty-three days to find the stolen coins and claim the five-thousand-pound reward that will assure Georgette’s independence. The journey that follows is an adventurous one, at times a dangerous one. The greatest danger may be the attraction that grows between Georgette and Hugo, despite the differences in their class and in their dreams. Readers familiar with the first book in Romain’s Royal Rewards Duo will not be surprised to see Georgette and Hugo paired in the second book, but the lack of surprise does not detract from the charm of their story. London and a ducal mansion may serve as the setting of early scenes, but this novel is atypical in its protagonists who are not engaged in tonnish activities and in the Northumberland setting. Its atypicality adds to its appeal. The novel’s greatest appeal however, lies in its characters. Georgette is independent and vulnerable, a winning combination in my opinion. She is also smart, funny, and spirited. Hugo, who sometimes wears spectacles (a detail I loved), is intelligent, driven, and honorable—and very much a nonconforming aristocrat. I adored them both, and their dialogue was a delight. Also a delight was the pace at which their relationship develops. Although the romance has its share of sizzle, this is one couple who do not fall into bed at the first opportunity. And they do experience real growth that includes a clearer sense of who they are. I’m not sure if their names are intended as a Heyer tribute, but they made me think of the author and of Hugo Darracott of The Unknown Ajax, one of my favorite Heyer heroes. The secondary characters are also well drawn. Jenks, the Bow Street runner, is particularly memorable. 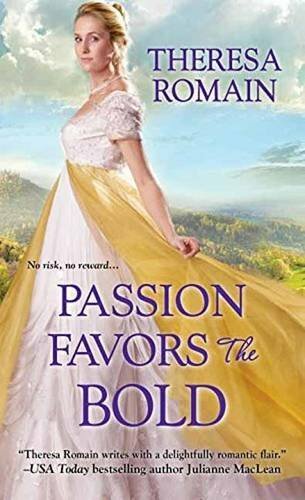 If you like your historical romance witty, charming, and heartwarming, I think you will enjoy Passion Favors the Bold. I recommend it without reservations. I love Theresa's books - she's such a wonderful writer! Love her stories too - this sounds like another great read! I'm a fan! Thanks for the review, Janga! I loved t he review. I've got this book but haven't started it yet. Another for my wish list.